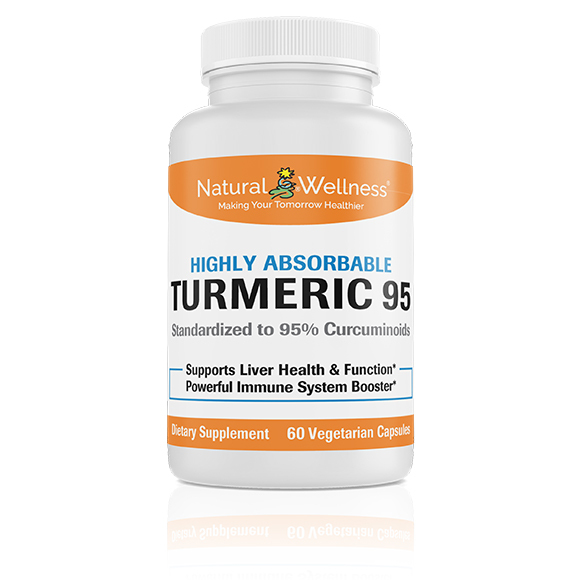 Why Does Turmeric 95 Provide You With Superior Protection? 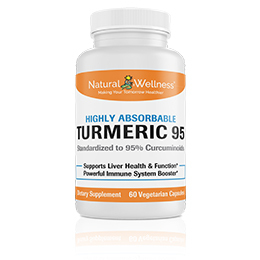 Turmeric 95 contains 95% curcuminoids (or curcumin), the highest level on the market today. 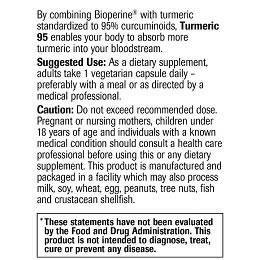 This means 95 out of every 100 milligrams of turmeric in Turmeric 95 is curcumin. Curcumin is the active ingredient in turmeric, responsible for all its numerous health benefits. Simply put, the higher the percentage of curcumin (or curcuminoids) in the turmeric you take, the more benefit and protection you receive. And 95% is the highest level available anywhere. 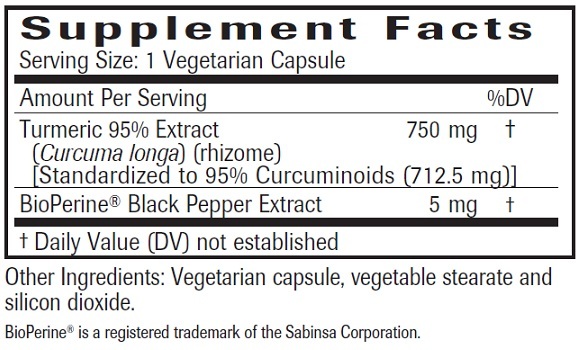 It's not just that we offer you the highest level of curcumin, we have also increased its absorption ability by 2000%. You're probably thinking this can't be true. Well, it is. By combining Bioperine®, a proprietary form of black pepper, with the strongest form of turmeric, Turmeric 95 enables your body to absorb up to 20X more turmeric into your bloodstream, so it can be utilized by your body. This is not just some made up number. It is backed by science and research. Extensive research has shown that the therapeutic effectiveness of curcumin without Bioperine is limited due to its poor absorption into your GI tract. When taken orally, only tiny amounts appear in your blood while the rest of the dose is excreted though your feces. 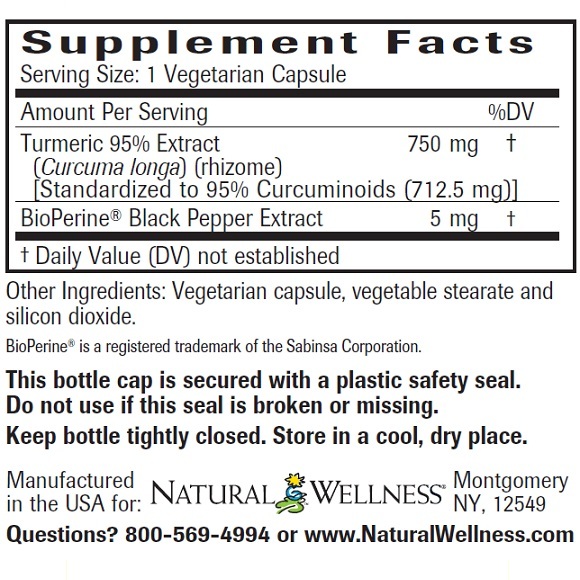 By combining Bioperine with curcumin, research has proven it increases the curcumin absorption by 2000%. Turmeric is an ancient root used for its healing properties for centuries. Turmeric comes from the rhizome (rootstock) of the Curcuma longa plant. This bright yellow-colored spice that is common to Indian and Asian cuisine is a powerful, healing herb. The active ingredient responsible for these benefits is curcumin. Although turmeric has been touted as a natural remedy for many different types of health ailments, it is extremely well known for its inflammation relief. Intense and numerous research has proven that the curcuminoids in turmeric prevent the actions of enzyme COX-2 in the body that is responsible for inflammatory reaction and the pain associated with inflammation. This is so important, since high levels of inflammation lead to so many serious short term and long term health issues. 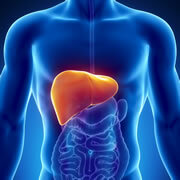 Turmeric is especially valuable to those with a compromised liver. 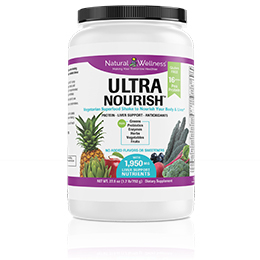 Assists the enzymes that are responsible for flushing out known dietary carcinogens, thus helping to detoxify the liver. Due to its anti-inflammatory properties, turmeric can be used to reduce heartburn, stomach problems, diarrhea and gas. In addition, the curcumin in turmeric has also been shown to stop the growth of Helicobacter pylori, or H-pylori, a bacteria which is linked to gastrointestinal issues such as gastritis and peptic ulcers. Curcumins in turmeric have been proven to stop the triggers that cause allergy responses without the side effects associated with many over-the-counter drugs. In scientific testing, curcumin remarkably reduced airway constriction making it easier to breathe. 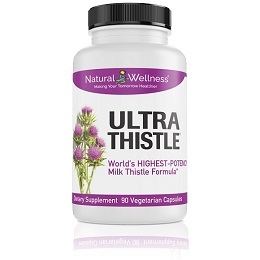 Also, curcumin reduced the inflammatory marker production in lung tissue, again enabling you to breathe easier, making this supplement an amazing choice for people who suffer from seasonal allergies and/or who have sensitivities to house dust and other common household breathing irritants. When considering turmeric supplementation, experts advise turmeric containing 95% curcuminoids – the highest curcumin content available. Remember, everyone's experience with a supplement is different, however we always offer a 100% money-back guarantee on every product. This is a very good product that I don't go a day with out.It does what it says it will do and is of good quality. My husband and I have been taking Turmeric 95 for many months and we can honestly say we don't feel any different. I guess it's a " just in case" type of supplement at this point. I have some pretty bad parachuting injuries in my ankles from a few nasty malfunctions back in the 80's which give me quite a bit of arthritis. The turmeric seems to help the inflammation so that my ankles seem to have gotten better since I've been taking the Tumeric 95. I started hearing about Turmeric and the many benefits it can give to your body, including to help with skin conditions. I have a condition called Hidradenitis Suppurativa, which causes cystic like acne in your lymph tracks. There is no cure, and I have been dealing with this since my teens. When I discovered that Turmeric has been known to be helpful for cystic "flare-ups," I purchased a bottle from Natural Wellness. I was already familiar with their products, since I am also using their Chocolate UltraNourish, and figured I was familiar with them, so what the hay. I have now been using Turmeric, for about 5 months, and along with improving my diet and exercise, my flare ups have been almost none. I believe the combination of all three have been a "pain-saver." If you know the discomfort these little buggers can bring when you get one in your armpit, you will look for anything to help take it away... I now continue to use my Turmeric as maintenance and will continue on with it until there is a cure. As a side note for anyone else looking to use this product for this condition - if you are having an extremely painful flare up, you can break open the capsules open and use as a paste directly on the skin (I do mix with local honey or rice milk, then apply, paste like consistency and let it sit overnight). For me, the relief was almost immediate. For the greater part of 2016, I was suffering from back and hip pain due to inflammation. 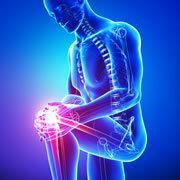 My healing plan started with stretching, visiting a chiropractor and going on an anti-inflammatory food diet. I started to feel better, but was still in pain. Two months ago I also started taking Turmeric 95, and I have felt a vast improvement in my back and hips! 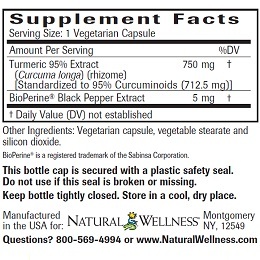 Each bottle of Turmeric 95 contains 60 vegetarian capsules. Take 1 capsule daily, preferably with a meal or as directed by a medical professional. Consult your medical professional prior to use if you have, or suspect you have, any medical condition, are currently taking prescription drugs. 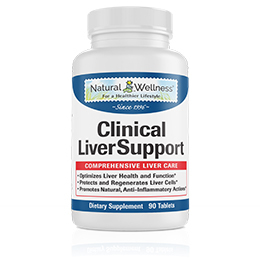 Not recommended for people with bile duct obstructions or gallstones. People who have had their gallbladder removed should consult their physician prior to taking this product. This product is manufactured and packaged in a facility which may also process milk, soy, wheat, egg, peanuts, tree nuts, fish and crustacean shellfish. 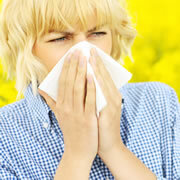 Check with your physician if you are taking medications. 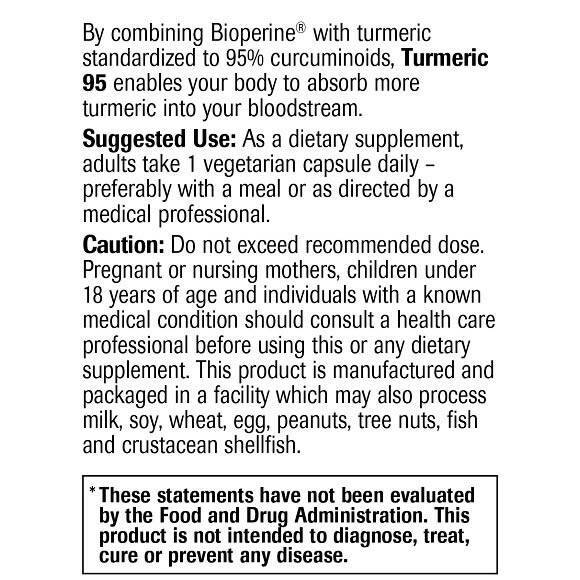 Turmeric 95 is MANUFACTURED in the USA to meet FDA strict current Good Manufacturing Practice regulations (cGMP).